War is coming lads, you best get dressed for battle in your finest armor, with your fiercest weapons. While armor and weapons are all well and good, no warrior is truly ready for battle until he puts on his Roman Leather Wristbands. It is said these bracelets are blessed by both Minerva and Mars, both patron gods of the different aspects of war. When these bracelets are put on, you will have the battle tactics of Minerva and the combat bravery of Mars. 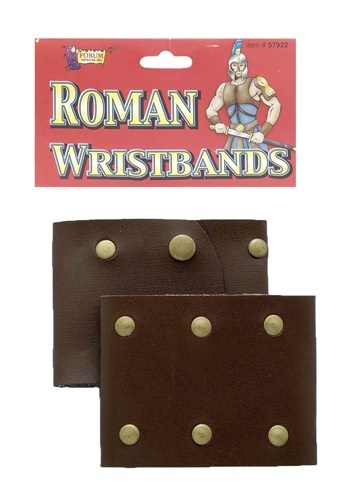 Not only will you look like a ruthless warrior when you wear these Leather Wristbands, you will also be nearly invincible – but remember no gift is free, and you won’t be completely invincible, just look at poor Achilles and is ankle. This wristband is sure to look great with any kind of Roman or Spartan costume! The material is very stiff and can rip if you aren't careful. The metal from the studs reacted to my husband's skin, causing lesions on his wrist. Unless you wear something underneath them to protect your skin, I would not recommend this accessory.